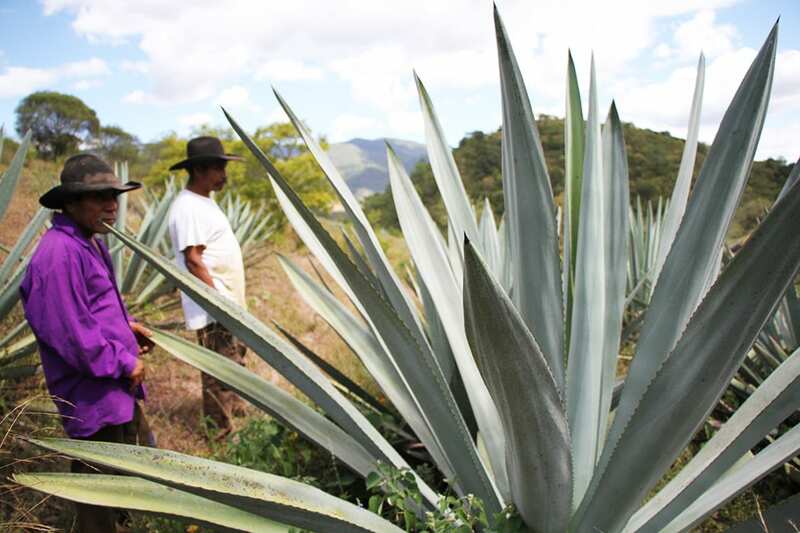 Mezcalero Salomón Rey Rodriguez (right) and his neighbor survey the agave plants growing in the nearby hills to evaluate what’s ripe and ready for harvest. 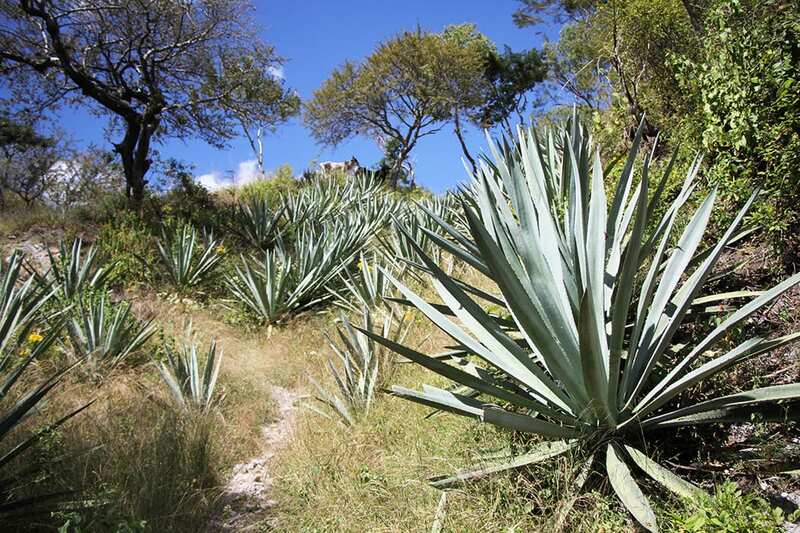 Of the hundreds of species of agave growing around the world, up to 50 are used to make mezcal in Mexico. With Cooper’s move to identify the variety of agave used to make a bottle, he inadvertently set a standard for mezcal brands to come. Now, similar to the way wines are made and classified by grape variety, most mezcal brands source single varieties of agave to make single-varietal releases, with the type of agave labeled clearly on the bottle. The ripple effect has meant that spirit menus are now commonly organized by variety of agave, and mezcal enthusiasts often collect their favorite varietals, coveting new discoveries in the same way one might cherish a single malt scotch. Tasting a single-variety mezcal can be illuminating—getting to know the profile of a specific plant type can emphasis how much of the mezcal’s flavor is informed by the raw material—but the practice of making mezcal with only one kind of agave is far removed from how the spirit has been produced in Mexico for hundreds of years. “Historically, a lot of these mezcaleros were subsistence farmers, living off the land in very remote villages,”says Mezcal Vago brand and operations manager Francisco Terrazas. “Land holdings were very small, with each family having just enough land to grow their food and raise a bit of livestock. Few, if any, had enough land to grow acres of agave, let alone different species in organized plots.” Most families only made mezcal a handful of times throughout the year for special occasions (and even then, only in the dry season). So when it came time to gather plants, mezcaleros would “usually just hike into the hills with a machete and a few burros to scrape together enough agave to produce a small batch of mezcal,” Terrazas says. Several different varieties of agave grow in the hills near Tio Rey’s distillery. With the assembly of wild, ripe plants gathered, mezcaleros would then cut off the leaves of each plant to reveal the heart, or piña, and roast them together in an earthen pit. That grab bag of cooked agave varieties is subsequently milled together, co-fermented and distilled, without separating any of the varieties at any point during the process (unlike most spirits blending practices where finished distillates are often blended together to create a final product). The results are what producers call ensambles (blends), mezclas (field blends) or mezcales del campo (mezcal of the fields). 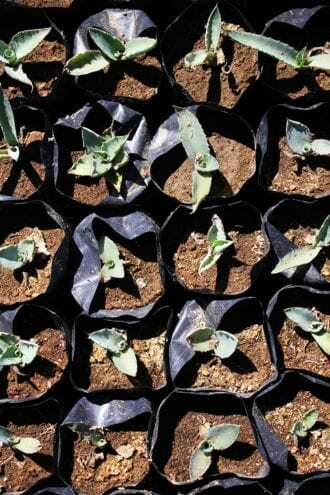 Baby tobalá agaves grow in the nursery at Real Minero. When they’re large enough, the plants will be replanted in the fields to grow to maturity. 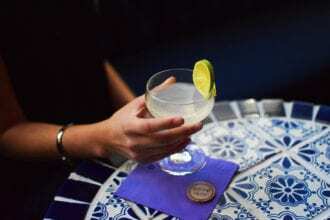 The Hemingway Daiquiri was created in Cuba for, you guessed it, Ernest Hemingway.